We are your only local partner that will supervise your loading procedures. Under our strict control, we will make sure that your wine is loaded perfectly. The two most variable parameters are temperature and dissolved oxygen. But many other are taken into account during the wine loading. A qualified winemaker will be present at your wine’s loading, and ensure the secure handling for your wine. A simple but critical parameter, not always taken into account. 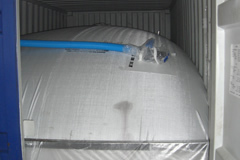 As with wine shipped in the bottle, wine shipped in bulk containers (ISO or flexi- tanks) is also subject to the effects of temperature variations. However, the large thermal mass of the liquid prevents significant temperature swings within the body of the container. This is because, as the wine closest to the outside of the tank heats, its density decreases slightly causing the wine to rise within the tank. This movement sets up convection currents within the tank and causes the temperature increase to be dissipated throughout the body of the wine. High temperatures accelerate wine development and, in bottles this can cause pressures that can compromise closures. Bulk wine is less prone to experience large temperature variations during transit. That is why it is so important to load the wine as cold as possible, ideally around 15°C or less if possible, to lessen the temperature variation during transit. Oxidation is an obvious potential problem with any form of wine shipment but especially so when large volumes are shipped in a single container. 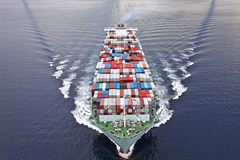 A defective seal on an ISO tanker or the use of a flexitank material that is highly permeable to oxygen can allow oxygen entry leading to degradation of the entire shipment. Good housekeeping, careful checking of ISO tank seals and/or the selection of suitable and appropriate flexitanks can mitigate this risk. Since the introduction of flexitanks in the early 1980s, the permeability of flexitank materials has decreased exponentially. In the 1990s, flexitanks were made from thermoplastic (PVC and polyurethane) and had an Oxygen Transmission Rate (OTR) of 100 – 200 cc/m2/24hr. In the early 2000s the tanks were a multilayered design constructed from a polyethylene film incorporating an ethylene vinyl alcohol copolymer (EVOH) barrier and had an OTR rating of 1 – 2 cc/m2/24hr. The latest systems have an advanced gas barrier layer with an OTR rating of less than 0.05 cc/m2/24hr. To avoid oxidation during transit, it is imperative to measure, control and lessen any possible income of oxygen into the wine. Ideally, we recommend to target <0,8 ppm of dissolved oxygen previous to loading. Many other analytical parameters are involved during loading of bulk wine. Our objective is to determine your specific requirements and make sure that the supplier is actually respecting them. Probulkwine © 2019 | Your Strategic Wine Source. | Load: 0.5 ms.